A Special Thank You and a Challenge! Today’s card is meant as a very special thank you to a new group of friends. We are always influencing and touching the people we come in contact with each day, either in a positive way, or a negative one. And everyone of these amazing people has given me so much in a positive way, probably without even realising it. If I miss anyone, please forgive me, but a special thanks to: The very amazing Tad and Adriana James, Georgette, Cat, Paul, Julie, Leah, Margie, Anita and Les, Naomi, and all the other amazing people who I would have loved to get to know better. And now down to the business end…. 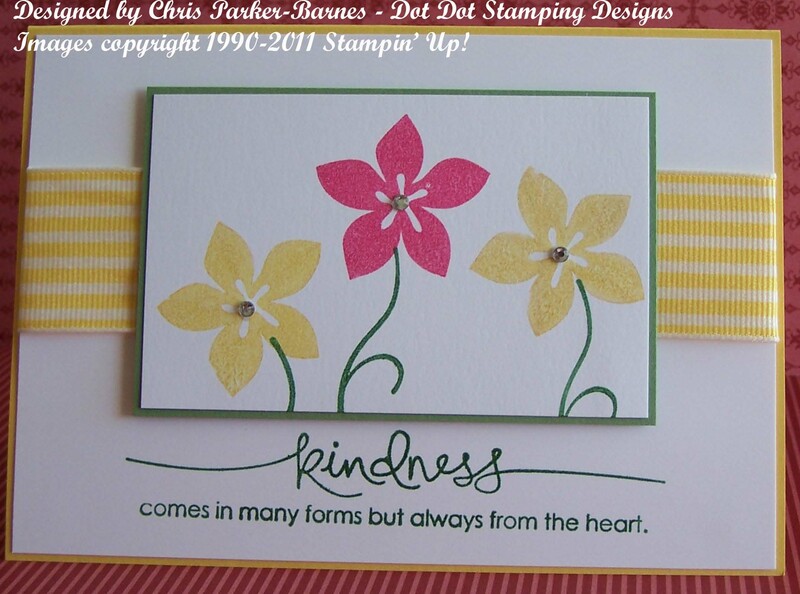 the colour combination, came from a challenge set by the girls at Stampin’ Royalty. The colours, Wild Wasabi, Melon Mambo and Daffodil Delight, just had to be flowers…… so I have used an old favourite – Cottage Garden, and for the greeting, Heard from the Heart, both from Stampin’ Up! Hope it brightens your day and reminds you that spring will be here…. sooner or later! Love your card. I haven’t used that set in soooo long and the shape of that sentiment is just perfect for your card. Thanks for playing with SR.
simple but SOOOO lovely! Thanks for playing this weeks Stampin Royalty Challenge!